Here in this world just outside the polluted and impersonal city limits, a miracle takes place, a relationship forged in perpetuity ensures the perfect survival of two species and the pleasure of all who appreciate the miraculous. Standing upright in confident spears, the yucca, or “Our Lord’s Candle” balances the native California landscape of soft mounding shrubs of buckwheat, manzanitas, coyote bush and sage with its vertical 10’ blooms rising from striking rounds of spiked foliage. This plant species has a story to tell about survival and perfect planning. Its presence in this chaparral is no accident; nature abhors such things so every detail of this wild land is deliberate, and none is more so than that of the yucca. 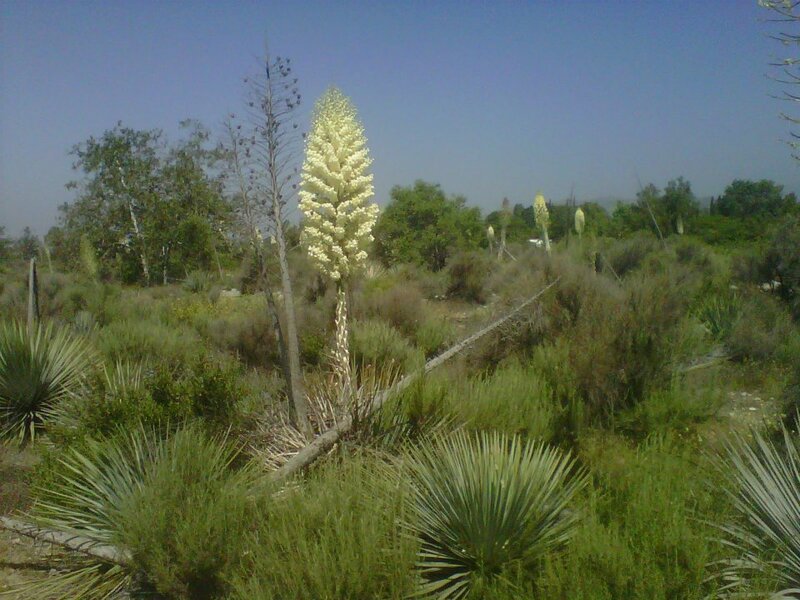 This stately plant owes its entire existence to one small inconspicuous insect: the yucca moth. And the moth in turn would perish forever without the relationship it has forged with the yucca. In the absence of either one of these species, the other would quickly become extinct. This small white moth is unique in the insect world: her mouth has a pair of spiny tentacles and her egg-laying tube is a sharp spike. One evening in early summer the moths emerge from their cocoons and mate just as the yucca begins to bloom. When the female is ready to deposit her eggs she does the most remarkable thing: this tiny moth enters flower after flower of the majestic yucca and gathers pollen from each in her tentacles. She rolls this pollen into a ball bigger than her head. Then she flies to another flower, inserts her sharp egg-laying tube into the flower’s ovary at the base of the pistil and lays just three eggs. She climbs the pistil and inserts the ball of pollen, rubbing it into the pistil and pollinates the yucca flower. The pollen is neither food for herself or her eggs, this action only benefits the yucca. Once the flower's ovary is fertilized it swells with hundreds of seeds. 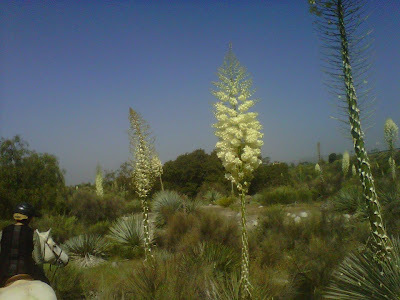 The yucca moths' young eat just a few seeds which is why so few are laid in each bloom. Then each little larvae bores a hole in the flower pod, emerges and drops slowly to the ground on a silken thread. It pupates in the ground at the base of the Yucca plant over the winter and leaves its cocoon the following year to start the cycle over again. 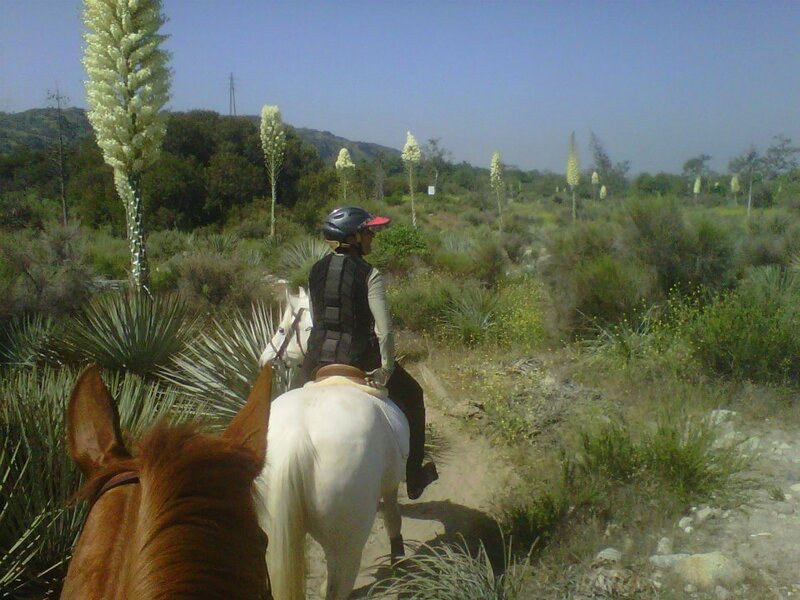 This year in the canyon, plant rustlers chopped hundreds of blooming yucca ‘trees’ down and stole them. I believe they were gathering the fertilized seed. The real crime is they stole the yucca moth larvae before they could complete their generous cycle. There will be fewer yuccas next year not only because these plant thieves stole thousands of seeds but because they destroyed so many of the yucca’s only pollinator. Nature is in perfect balance. When man disrupts it, even in a 'small' way: the balance is upset in ever expanding measures. The loss of a small insect and the plant whose life it ensures can change a whole landscape and the habitat of hundreds of species. Ecology is an exact science whose members (including man) occupy space and coexist in perfect union. It amazes me that a tiny little life like the yucca moth can think ahead to a future she will never see, yet human beings cannot. Very interesting story! Great photos too, of course. Thank you for the explanation - I'd known of the association of the Yucca and the Moth, but hadn't known of the specificity of the behavior. Amazing! Yucca flower petals are edible. They taste like watermelon, but they have an unpleasant (to me) aftertaste. "It amazes me that a tiny little life like the yucca moth can think ahead to a future she will never see, yet human beings cannot." The statement reminds me of a scripture that reads, "What profit is there to a man if he gains the whole world, but loses his soul". Is it really worth the effort to steal away the seeds of the "Lord's Candle", so the thief can make a profit - sad. Instead, the perpetrator should take these words of advice from Matthew 6:28 “And why do you worry about clothes? See how the lilies of the field grow. They do not labor or spin. 29Yet I tell you that not even Solomon in all his splendor was dressed like one of these. 30If that is how God clothes the grass of the field, which is here today and tomorrow is thrown into the fire, will he not much more clothe you, O you of little faith? Thank you all so much for your appreciation of this post and your insightful and moving comments! I find solace and sanity among the wild areas of The Canyon... I trust you will too!